Anna Bartoszewicz-Wnuk, Anna Młyniec and Agata Sekuła, one of the most recognized experts in the Polish real estate sector, have for many years been enhancing the JLL brand as the leading advisory agency in Poland. Before joining JLL in 2012 as financial director, Savvas Savva had worked in the financial and consulting industries. He is responsible for the company's finances in CEE and has overseen two key M&A processes in JLL in Poland during his tenure. “These board nominations are of course based solely on merit. However, from the moment the JLL board was extended, we became one of the few real estate companies in Poland and the world, where most of the board members are women. What’s more, the percentage of women and men in senior positions in the Polish JLL office has been equal for a long time now. This greatly translates into an excellent working atmosphere, and above all excellent company results”, says Tomasz Trzósło. It is not the only significant change in the company's structures. JLL has recently announced the appointment of Tomasz Trzósło as the Managing Director of the CEE markets, to engender greater integration and cooperation in the region. Anna Bartoszewicz-Wnuk heads up the Workplace Advisory team at JLL Poland, offering clients strategic services that support optimal adaptation of offices to the nature and needs of companies. Prior to this, Anna led the Research and Consulting team for ten years. Her clients included real estate investors/landlords and developers. In addition, Anna has been deeply involved in ABSL activities - the leading organization representing the business services sector in Poland. Anna has also contributed and initiated well-received research for JLL publications and reports. Anna Młyniec is managing JLL’s office leasing and tenant representation activities. She advises on the optimization of office portfolios, new office acquisitions, relocations, consolidations and renegotiations of leasing contracts. Her key areas of expertise include strategic advisory and support for office tenants, both planning to enter Poland or expanding their activities in the country. Anna has cooperated with companies including Credit Suisse, Lionbridge, Shell, or The Boston Consulting Group. In addition, Anna was responsible for creating and developing a database and information platform dedicated to the office market in Poland (bazabiur.pl/officefinder.pl), as well as supporting and implementing this solution on other markets in the region. Agata Sekuła, Head of Retail Investment CEE, has participated in numerous financing deals including development debt, investment debt, equity raising, sales and acquisition and sale and leaseback transactions as well as portfolio deals. The JLL Retail Investment team finalized deals in excess of €12 billion under her leadership. These transactions included such properties as Manufaktura, Riviera, Stary Browar, Silesia City Centre, Galeria Katowicka, Magnolia, or Chariot Portfolio. 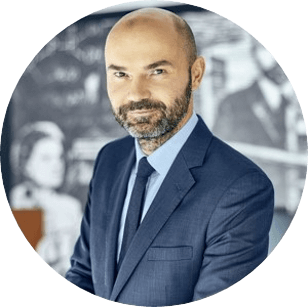 Savvas Savva has more than 20 years' experience in the area of finance, which he gained in the consulting industry (one of the Big Four companies), research, and the banking sector. He joined JLL in 2012, where he’s been responsible for the company's assets in Poland, Czech Republic, Slovakia, Hungary, and Romania. In the last few years, Savvas has overseen the processes of two acquisitions - in 2015, Tétris, an international company from the JLL group, bought Neo-Świat, and at the end of 2018, JLL joined forces with the residential consulting company REAS.